I mean, heck, I apologize 3 times in a row (perhaps a sign of OCD?) when I bump into a garbage can on the streets. So if you see a petite, stubby, Asian lady walk into a garbage can on the street profusely saying, “sorry”, it moi. 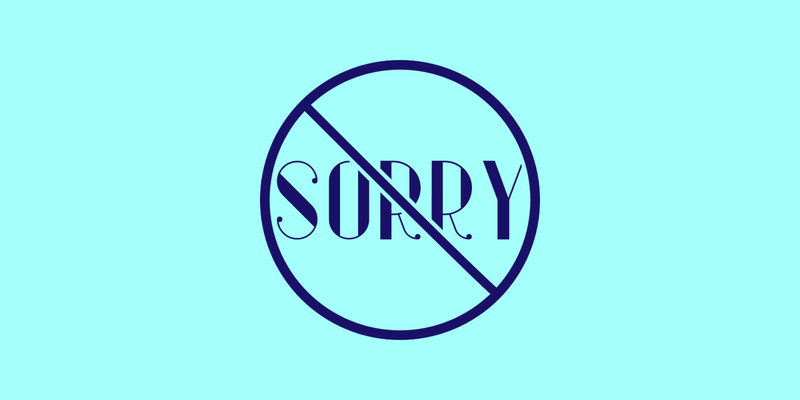 Being a strong, independent, and beautiful on the inside lady of the 21st century, I’ve made a resolution to stop saying sorry as much. Apparently women apologize too much in the workplace and we should STOP. Instead of apologizing in situations where your boss critiques your deliverable, we should instead thank them for their advice, etc., etc. However, because saying sorry is so engrained into our nurture vs nature “DNA” of being a Canadian, sometimes when we don’t say sorry we start feeling guilty afterwards. Introducing, Postpardon Depression, the disease you didn’t know had a name till now. For those of you who don’t get the pun, you really did not finish watching all seasons of Nashville where Hayden Panetierre/ Juliette Barnes gets some mood swings after *SPOILER ALERT* giving birth. Symptoms may include extreme sadness, low energy, anxiety, crying episodes, irritability, and changes in sleeping or eating patterns. Those symptoms are very close to the symptoms of Postpardon Depression. So now you’re asking, what is Postpardon Depression? It’s that feeling you get when you don’t say sorry in a moment that you’d usually say sorry and can’t stop thinking about it. The guilt envelopes you in a heavy winter blanket and all you can do is just keep sinking into bed. There’s no way out. Next think you know it’s the next day and you’ve just taken a 22hour nap and it’s…. I’ve experienced this when I may have pushed it with a comment that I’ve said to a friend, a family member, a boyfriend (note I said A boyfriend, which implies that I perhaps have many (^_~)). However, for some reason, whether it’s cause you’re stubborn or just too much time has passed by, you don’t say sorry and then consequently start feeling the guilt of not saying sorry. So what’s my goal with this post? To shine light on this issue to raise AWARENESS. To let people know YOU ARE NOT ALONE, YOU DON’T NEED TO SAY SORRY, AND YOU DON’T NEED TO FEEL BAD ABOUT IT.